Mr. Suyama is a painter who lived at the Iriomote Island in Okinawa Prefecture, and keeps on creating the elaborate pieces in realistic style. He exhibits his works in the galerie nichido Fukuoka after an interval of five years. He has been drawing something close to his daily life, as shells, insects, flowers, mangroves, besides musical scores and cards, listening to the sounds of wind and wave at the Island, as well as classical music. 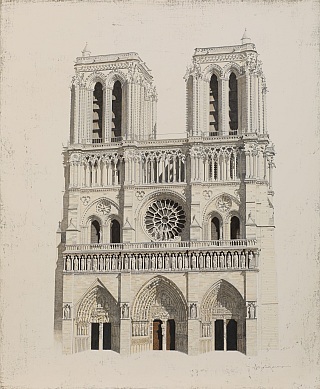 For this exhibition, he newly created the many pieces taking some motifs from the city of Paris and Notre-Dame Cathedral, where he first visited three years ago for his exhibition. His paintings arise us the feelings of awe to the human civilization. Not merely the realistic paintings we know, but we can see the original realistic style on his paintings. Their silence and calm bring the viewers into the world of his paintings. We are looking forwards to seeing you at the gallery to step into the World View of Mr. Suyama. Profile 1958 Born in Fukuoka 91 Moved to the Iriomote Island in Okinawa Prefecture. 95 Ryuseki Art Exhibition Awards of purchased paintings, Okinawa. 99 Turner Acryl Award of MAEDA Jousaku 2001 Merit Award of the 36th Exhibition of Showa-kai 02 Exhibition at the galerie nichido Fukuoka 04 Cultural Encouragement Award of the Kita-Kyushu Citizen 05 Exhibitions at the galerie nichido (Tokyo･Fukuoka, 2010･14) 07 Nominated the Award of the KOISO Ryohei Grand Prize Exhibition 16 Exhibition at the galerie nichido Paris Presently an independent painter.